Meet the newest member of our family here at the parsonage. His name is Lord Willoughby Clive. He is a 10 week old Old English Sheepdog. Handsome fellow, isn’t he? He is fabulously behaved. Very pensive little puppy. The children adore him. Even Lucas Joe seems to like him. (Which shocked us all, since the old man really despises most puppies.) Lucas and Willoughby have even been playing together. We looked for some time to find the perfect puppy for our family. It is a long process. I found a great many scams. (If you are buying a dog online, beware of the scams! They are numerous and range from sly to outright ridiculous.) 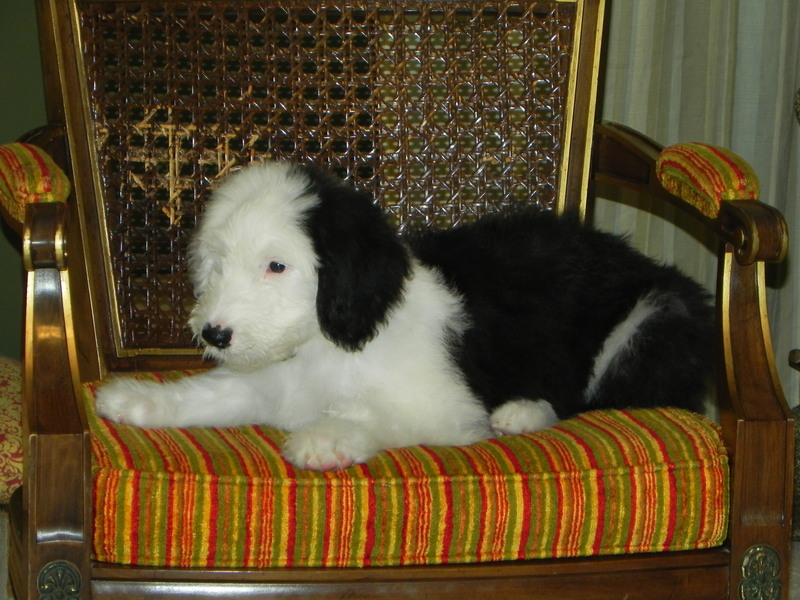 The Pastor really wanted an Old English Sheepdog, but figured we would buy a smaller pup for now and maybe several years from now he might some day get his wish. 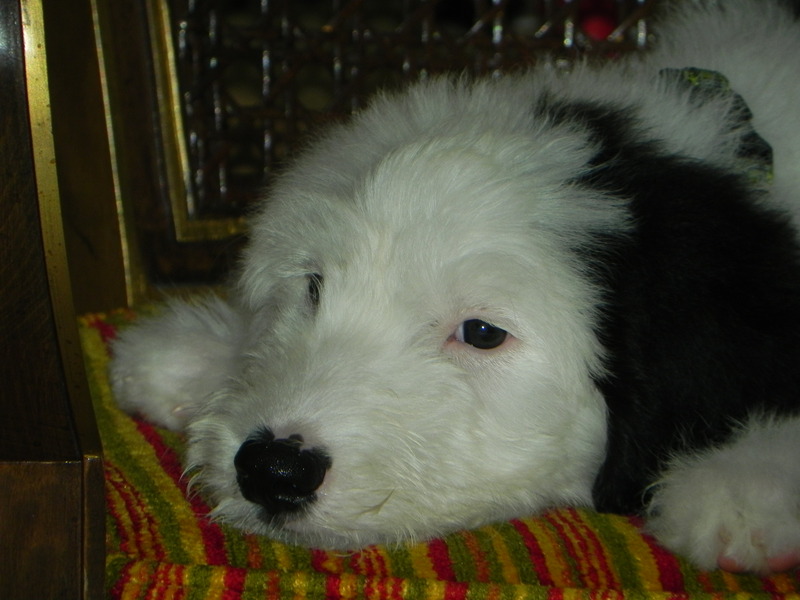 It wasn’t until we met a poodle that I decided we should get the Old English Sheepdog. Silly, I know. But meeting the poodle, who was nice enough for a poodle, made me realize he just wasn’t right for us. I knew a larger dog would be much better with the kids. 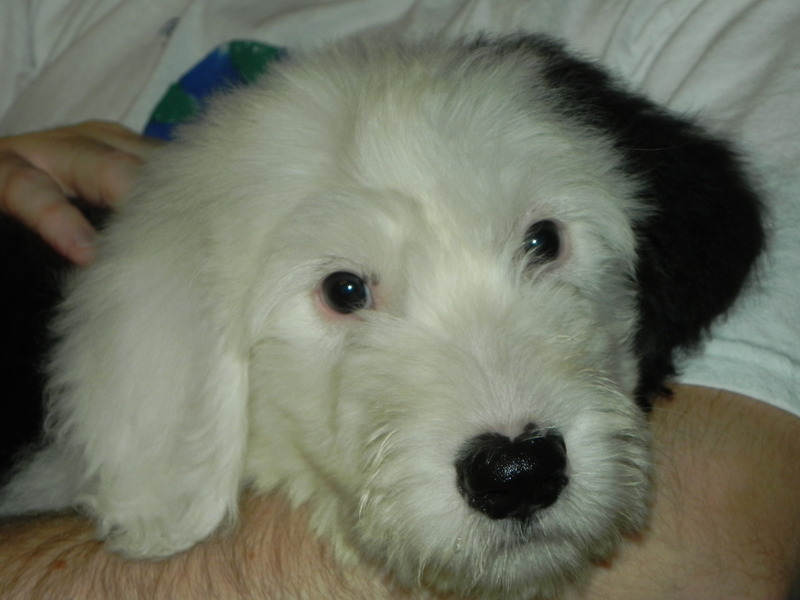 And while I preferred a Great Dane, I found a breeder fairly close with an Old English Sheepdog puppy. If you are looking to buy a puppy, here are my tips. 1. Don’t go to the pet store! They rip you off. Really. The only advantage is that you see the puppy, you walk out with the puppy. Their financing offers make it seem perfect, but you’ll overspend. ($1300 for a chihuahua!) They do occasionally have sales, but typically that is when a dog is no longer a puppy. 2. Don’t bother with the classifieds, especially online classifieds. That is where you’ll find lots of scammers. Never pay money for a dog you can’t see in person. 3. Websites like puppyfind.com and AKC Classifieds are great websites to find breeders near you. Both let you search by breed and by location, so you’ll find the puppy near you for you! 4. Don’t rush. Finding the right dog is a big deal. You can take as long as you need to. Look at dog breed info and figure out which breed is right for you and your family. Not all breeds are best for all people. Take some time to think about what you want in a dog. (Do you want a snuggler? An exercise buddy? A guard dog? A playmate for the kids? A lap dog?) Find the breed and the dog that fits your family. There is nothing worse than taking a dog you know to be ill suited for your family and trying to train him to fit into your guidelines of what he should be. It is much easier when you get a dog best suited for you- the training is much more minimal and you’ll find the experience a good one, rather than a trial. 5. Have realistic expectations. You’re not going to find an English Bulldog for free. You won’t find a toy dog that isn’t going to be difficult to housebreak. You won’t find a dog that requires nothing of you. Go into this knowing it won’t be free and puppies don’t train overnight. Keeping your expectations simple will allow you to have a fabulous experience. If you think you’ll find a show dog for close to free and have to do no training, you are bound to be disappointed! Good luck to you finding your Willoughby! I’m a new follower by the way *waves* Hi! I had to pop in and say that I thought this was a stuffed animal until I clicked through and read this post. SO PRECIOUS. And right when I have puppy fever but cannot get one! *waves* Hello, to you, too! Is he not the most adorable thing you’ve ever seen? And I am completely sorry for making the puppy fever worse! oops – that last one was in reply to this. Absolutely precious!!! When my baby Elijah turns 2 or 3 we’re going to get him a puppy to grow with! It’s going to be so hard to wait! For now our one older gal will have to do!